The Tulip Ride is a guided motorcycle ride that raises money for Seattle Humane. 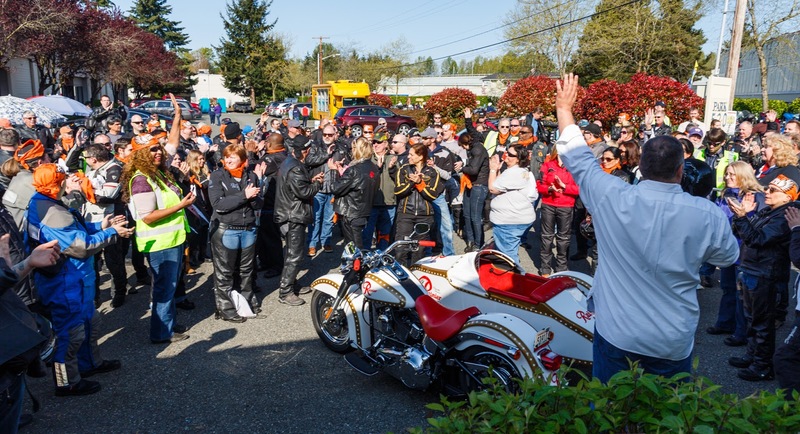 Last year, hundreds of bikers and their passengers raised $100,000 for Seattle Humane! The riders will be joined by actresses Tricia Helfer (Lucifer / Battlestar Galactica) and Katee Sackhoff (Longmire / Battlestar Galactica), actors Karl Urban (Star Trek / Lord of the Rings), Kurt Yaeger abd Chris Reed (Sons of Anarchy) and Bender and Bailey from 106.1 KISS FM’s “The Bender and Molly Show”. The celebrities will be available for photographs before and during the ride. Meet at Blazing Bagels in Redmond at 6975 176th Ave NE, Suite 365 and ride to the RoozenGaarde Tulip Farm located in Mt. Vernon at 15876 Beaver Marsh Rd. For specific route information, check out the Tulip Ride site’s route map. All tickets include the ride, admission to the tulip farm, a BBQ lunch and a moto-themed gift bag including a commemorative pin. The Tulip Ride began 17 years ago as a way for several Microsoft employees to blow off steam during the launch of the original Xbox. On a whim, a group rode up to the Skagit Valley Tulip festival. They extended the ride by heading to LaConner for lunch and then home by cruising down Highway 20 over Deception Pass. It was such a great day that it became an annual tradition that grew into the charity event it is today. Is there any way to register as a passenger, and hook up with a bike in Redmond the morning of? I checked with the organizers. Their response: Unfortunately, due to potential liability, we are unable arrange travel as passengers on motorcycles. People are welcome to join us in the morning via the "Breakfast Only" option at http://www.tulipride.org/register.php.